Growing risks from CLOs — is history doomed to repeat itself? Everything’s great, right? Perhaps, for the moment. But while stocks are surging, there’s a very real danger brewing in the credit markets. We discussed this on our March 15th Digest, noting how corporate debt has increased 86% since 2007. The concern is that many corporations locked in low rates a decade ago. But $3.5 trillion of debt from high-yield and investment-grade issuers will be coming due in the next three years. That means many of these companies will have to roll over their debts when interest rates are much higher. It turns out there’s another specific concern here — one that has hints of 2008. It’s been on Neil George’s radar since last October, and the financial media is beginning to pick up on it as well. So, in this Digest, let’s make sure you’re aware of what’s happening. That way, we can toast the surging stock market today, while preparing for the risks of tomorrow. I’m going to turn to Neil, editor of Profitable Investing, to help explain a CLO. Neil is a master income investor, helping subscribers find high-quality income, whether that be from dividend stocks, bonds, REITs, MLPs, or other instruments. The downside is that the loans tend to be light in documentation as opposed to traditional origination of corporate bonds. The originators, eager for fee income, can push transactions that might lean on the aggressive side. And buyers of CLOs often don’t or can’t do their homework on what’s really under the hood. And since many of the underlining loans in CLOs are subordinated to corporate bonds, there is additional credit risk if and when something goes wrong. Now, if all of that sounds somewhat familiar, it’s because CLOs are very similar in nature to CDOs — which are “collateralized debt obligations.” And we all fondly remember CDOs as the financial weapon of mass destruction that nearly destroyed the global economy back in 2008. Now, CLOs aren’t inherently bad. The problem — similar to what happened with CDOs — is when investors don’t “do their homework” as Neil said, separating quality CLOs from the trash. As long as the originators are good at credit analysis and the investors take the time to know them before they buy, it’s all good. However, as we found out in 2007-2008, many buyers don’t do their homework. And when cracks formed in the underlying loans, black holes began to form on the balance sheets of banks and financial firms. Investors assume that the portfolios are safer because they’re diversified. Yet, relative to mortgages, corporate-loan portfolios typically are made up of fewer and larger loans, which increases concentration risk. A recent Washington Post report, built off conversations with 31 current and former officials and bankers, detailed some safeguard concerns. Specifically, Trump’s appointees have removed or ignored some of the regulatory policies that limit corporate borrowing. So, what’s the impact of that? 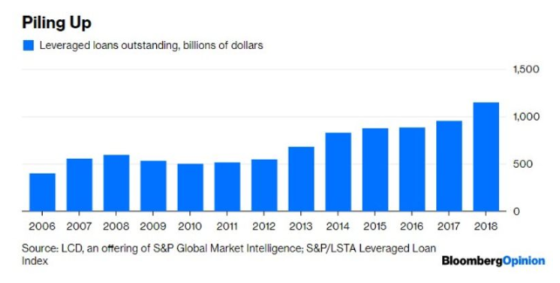 By the end of last year, roughly $1.15 trillion in leveraged loans were outstanding — that’s more than twice the volume that existed just prior to the 2008 crash. ***What’s the real risk here? How might this play out? Shades of the Great Depression’s bank-runs, would you say? Well, first, this is a systemic issue that’s far beyond our ability to directly control. If worst-case scenarios are going to play out, you and I will be affected. That said, our best defense is a balanced asset allocation. That means not having all of your wealth concentrated in only stocks or bonds. There’s also gold, real estate, various commodities, even cash. And, of course, though it might be common sense, take the time to know what you’re investing in. The trouble back in 2007-2008 is that the investors didn’t take the time, nor the effort to fully analyze and comprehend the underlying values of the pooled assets and liabilities. Rinse and repeat is unfortunately the reality of the financial markets. And if we’re not careful, we could eventually see another event like the Great Recession. Article printed from InvestorPlace Media, https://investorplace.com/2019/04/hints-of-2008/.